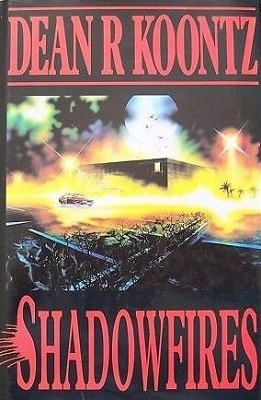 Shadowfires was first published in 1987, but Dean Koontz originally chose to publish it under the pseudonym Leigh Nichols. The central character is a lady named Rachael Leben. Her ex-husband, Eric, remains is very possessive and terribly rich. The only thing that scares him is the thought of dying, but that’s something he has to deal with right at the start of the book because stepping into the path of an oncoming garbage truck is not a good way to ensure a long life. When he hears the news about Eric’s death the new man in Rachael’s life—Benny—rushes to be by her side and it doesn’t take Benny long to realize that something is worrying her. It’s obvious the moment she opens the door to him because she’s brandishing a gun. Benny tries to find out what Rachael is afraid of, but she won’t say. Then the call comes in: Eric Leben’s body has gone missing from the morgue. Shadowfires is a zombie story with a difference. It offers a fresh and unusual slant on an old theme. For me to say any more than that would be a spoiler for anyone who wants to read the book. The two main characters in Shadowfires, Rachael and Benny, are both easy to like and it is interesting to watch their relationship develop throughout the story. If I had to pick a most-hated from the characters it wouldn’t be the un-dead Eric Leben. It would be DSA agent, Anson Sharp. Eric was a monster, but I grew to pity him in some ways. I found nothing to make me pity Anson Sharp, but plenty to make me hate him. Sharp is a strong character though, and integral to the story. A lot of the subplots centre around him and I’m willing to bet a lot of people who read Shadowfires will grow to hate him. If you decide to read Shadowfires, watch out for a guy nicknamed The Stone. He only graces a few pages, but what a guy! Other characters to watch out for are the cops Julio Verdad and Reese Hagerstrom. Like a lot of characters in the book, they are quite complex. As is their relationship. I read the paperback version of Shadowfires and my copy was 598 pages long, so it certainly isn’t one of Dean Koontz’ shorter novels. However this is a story that has such a lot happening, and so many great characters, I think I must have experienced every emotion known to man. It’s a great book.